Josh Elam dominated the Frankenstein Engine Dynamics Late Model Heads-Up competition from beginning to end, starting in qualifying, where he outran the field by more than half a second and 12 mph. Elam, at the controls of an ’09 Corvette, clocked an outstanding 8.86 at 163 mph, and ran even quicker and faster in eliminations. 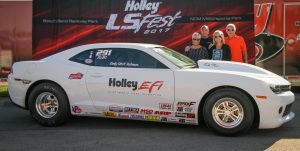 With an odd number of entries in the 13-car field, Elam was awarded a single in the first of four rounds of eliminations. He lifted early for a parts-saving 9.76 at 112 mph, eased off in a quarterfinal win over Chicago’s Johnny Matney, 9.66 to 10.82, then poured the coals to it in the semifinals against the similar ’08 Corvette of Mark Cook. Elam pounded out low e.t. 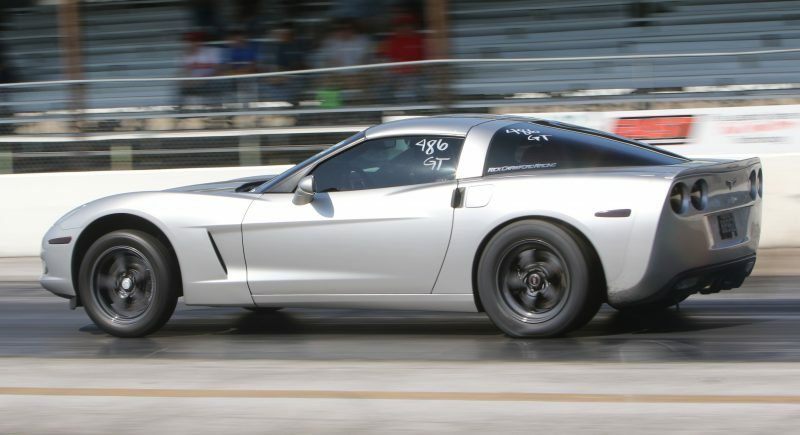 and top speed of the meet – an 8.54 at 164 mph – to cover Cook’s 10.57/139, then cruised to a 9.01/163 in the final against Lester Miller’s Arkansas-based ’10 Camaro. Lester defeated Bradley Maynard, Jeff Nance, and Rodney Booth to reach the finale. Darren Morris of nearby Bardstown, Ky., plowed through six grueling rounds to drop Robert Strong for Sam Tech Street King honors, clicking it early for a coasting 11-flat at 102 mph in the final round when Strong, of Pensacola, Fla., red-lighted. Strong, at the wheel of an ’87 Monte Carlo, missed the green by just 39-thousandths of a second. 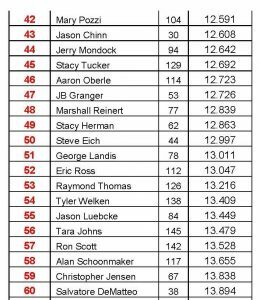 Driving a ’99 Firebird, Morris had some of the best reaction times of the entire event and cut a better light than his opponent in all six rounds, including a .037 in the second round that gave him a huge holeshot win in a heads-up match with Arkansas’ Coy Scott, 10.91 to 10.81. Morris was sub-.100 on the Tree in every round and averaged a .053. With a .042 reaction, he qualified No. 6. Strong was No. 3 with a .026, and Texan Bryan Williams paced the field with a .013. Scoggin-Dickey Parts Center Chevrolet Performance Stock was the domain of Muncie, Ind.’s Jesse Wilson, who won a showdown between the top two qualifiers in the all-Camaro final. Wilson led all qualifiers with a 10.09 – the only run in the 10.0s all weekend – and Haley Rounsavall was right behind him with a 10.14 and just ahead of Kevin Lumsden’s 10.17. Wilson also had low e.t. of all three rounds of eliminations – but not by much. He clocked at 10.12 in the first round, just ahead of Rounsavall’s winning 10.15 against Keith Vaughn and Lumsden’s 10.18 over Scotty Duncan. All three ran 130 mph. In the semifinals, all three winning times were in the 10-teens, with Wilson’s 10.14 the quickest, and in the final Wilson unloaded low e.t. of eliminations, a 10.12, to ice Rounsavall’s clutch .016 reaction time and 10.60. 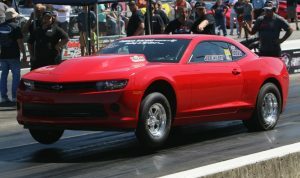 Elk Grove, Ill.’s Anthony Manna ruled the Nitro Gear Drag Radial category, which was contested on the eighth-mile. 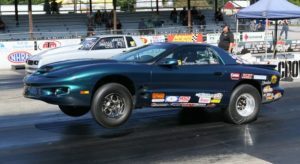 Strapped into a ’98 Camaro, Manna had some of the best reaction times and by far the fastest car of every round, running within a tenth of a second, from 4.53 to a 4.62, in all four rounds of eliminations. Andy Essary qualified No. 1 by a wide margin with a 4.58 at 168 mph, but when racing commenced, it was all Manna. He reset low e.t. and top speed in a 4.56/172 first-round win over Josh Shumway and really lowered the boom on his second-round single, eclipsing both marks with a 4.53/180. Following a consistent 4.55/178 semifinal win over Bossier City, La.’s Ryan Magee, Manna brought home the gold with a final-round win over John Smith, 4.62/176 to 4.91/150. Hometown racer Jessie Coulter had Wiseco Real Street all the way with excellent reaction times and amazingly consistent passes round after round. After qualifying on top with a 4.67 (eighth-mile) that held up all weekend as low e.t., Coulter drove his ’91 Camaro to victory to four consecutive round-wins with times that varied by just two-hundredths of a second (4.72-4.74) and speeds that varied by less than half a mile per hour (151.95 to 152.33 mph). Nicholas McGrath qualified behind Coulter with a 4.73 and established top speed for the weekend with a 152.42-mph speed on that run. 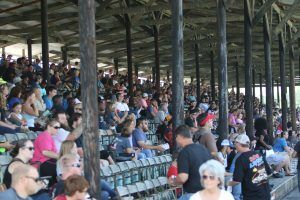 With the next-best runs of every round behind Coulter’s barrage of 4.7s, he advanced to the final, where his E.T. and speed were almost identical to Coulter’s (4.747-4.754 and 152.21-152.02) but were nullified by a red-light start. 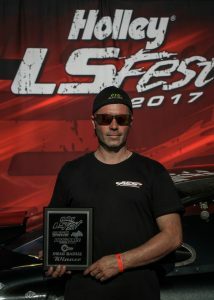 Mike Morris, father of Sam Tech Street King winner Darren Morris, outdueled the biggest field at LS Fest – Three Pedals Rumble, which is open to all vehicles powered by an LS-style or current-generation LT powerplant except dragsters, roadsters, and altereds. Wheeling an 11-second ’57 Chevy, Morris, of New Haven, Ky., dialed 11.25 for all seven rounds, culminating in a final-round matchup against Jackson, Tenn.’s Matt Brasfield, who was dialed at a 12.25. Morris, who had his best reaction time of the event, .028, in the semifinals, was a winner before he left the starting line when Brasfield cut the lights a little too close for a -.031 red-light start. On the way to the final, Morris knocked out Joe Hammann’s ’65 El Camino, Steve Criss’ ’10 Camaro, Paul Lewis’ ’04 Pontiac, Charlie Polly’s ’15 Chevy SS, and Robert Farley’s ’98 Corvette. Chris Bishir ruled the True Street division with by far the fastest runs of the event, guiding his powerful Chevy S-10 pickup to amazingly consistent times of 8.84, 8.62, and a best of 8.58 for an 8.68 average and a train-length win. Justin May was runner-up with two 8-second passes and a 9.04 average, faltering only on his second of three runs, a 9.58. 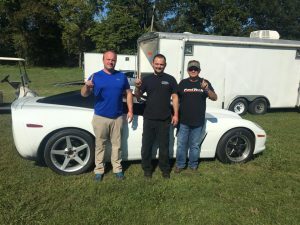 Also scoring were Sean Moore, who won the 9-Second class with a Camaro; Anthony Britton, who won the 10-Second class with a Camaro; Harv Owen, who won the 11-Second class with a Corvette; Adam Valentine, who won the 12-Second class with a G8 GT; Jason Stephenson, who won the 13-Second class with a Silverado; David Stacy, who won the 14-Second class with a Camaro; and Edmund Hyde, who won the 15-Second class with a Chevy 1500 pickup.